France laid its first submarine cable in 1869, between Doléen, near Brest on the western tip of the French mainland, and the islands of Saint-Pierre et Miquelon, off Newfoundland, Canada, with an extension to Duxbury, Massachusetts. The cable was laid by cableships Great Eastern, Hawk (laid the European shore end), Robert Lowe (landed the St. Pierre shore end), Chiltern, Scanderia, and William Cory (laid and landed the Sydney and Duxbury extensions). 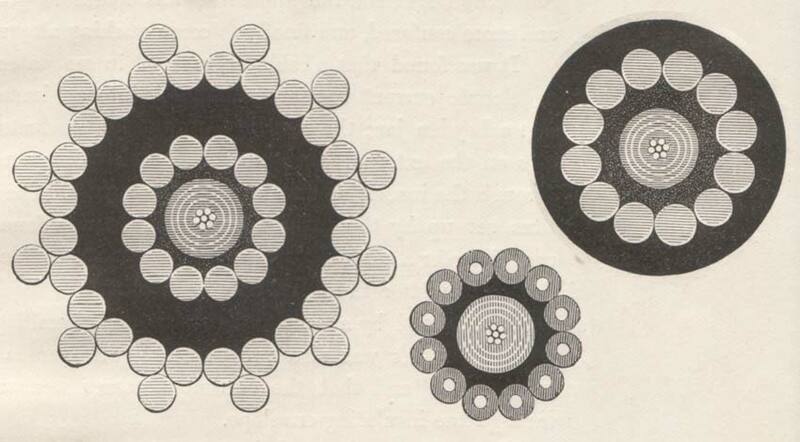 The illustration shows the three weights of cable used for the main cable from Brest to Saint Pierre. All had an identical core of 7 copper strands. On the left is the shore-end cable, armoured with 12 No. 7 BWG and 12 strands of 3 No. 4½ to resist damage from rocks and ships' anchors. On the right is the intermediate cable, 12 No. 4 BWG, used to run from the shallows near shore out to deeper water. In the center is the deep-sea cable, the main length of the run, which has the lightest armouring of 10 No. 13 BWG each wrapped in 5 strands tanned manilla. The diagrams are to scale; the deep-sea cable is about 1" diameter. The run from Saint Pierre to Duxbury also used a 7-strand copper conductor, but had different armouring from the main cable. The deep sea and shore end sections for this part of the route are shown below. Images courtesy of the Ladd Observatory collection at Brown University. Telcon, the Telegraph Construction and Maintenance Company, of London, manufactured the Brest to St. Pierre section of the cable, and subcontracted W.T. Henley to make the St. Pierre to Sydney length. For more information see the main page for the French Atlantic Cable. translated from the French by Silvanus P. Thompson, 1891.